St Andrews Table Tennis Club members, Dave Beveridge and Howard Lee were recently awarded the UKCC Level 1 coaching certificate. The awards followed two days of tuition at Ward Road Gym, Dundee between which the guys had to complete a significant portfolio of research into areas such as child protection, motivation, behaviour management and securing a safe coaching environment. At their final assessment they also had to demonstrate that they could prepare and deliver a lesson plan full of fun and games to beginners, simulated by requiring them to teach a specified stroke to a group of experienced players wielding the bat in their ‘wrong’ hand. It was surprisingly successful! 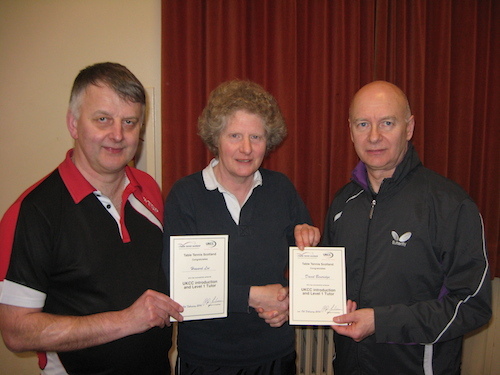 Their tutor and assessor was Paul Jackson, Table Tennis Scotland’s director of coaching. Our boys are photographed receiving their awards from club head coach and Scottish table tennis legend, Elaine Forbes. Left to right: Howard, Elaine and Dave. This entry was posted in St Andrews Table Tennis Club on March 31, 2014 by standrewstt. Monday 24th March was the last night of our 2013/14 bookings at Victory Memorial Hall (though we still have the AGM to look forward to on Monday 19th May). The fun started with the youngsters, who indulged in an hour of skill-related games based around a ridiculously high net, table tennis battleships, table tennis noughts and crosses, and earning creme eggs and chocolates by hitting targets, including their opponents sweeties. Fortunately none of them ate enough to be sick – at least not before the journey home. It was Elaine Forbes’ last night in charge of the kids and she got a nice round of applause for her efforts. Elaine then organised a night of informal handicap play for the ‘grown ups’ who displayed sufficient competitive spirit (i.e. shouting, sulking and ‘chaws’) to make it look like it really mattered. At least no one could complain about Elaine’s handicapping system which resulted in only 4 straight set wins out of 24 matches played and numerous sets won and lost on a sudden death deciding point. After the full round robin was completed, Neil ‘winning doesn’t matter to me’ Lea (aye, right) was tied on five wins with new member, and fine prospect, Robert Brown. Kong Wan and Dave Beveridge shared joint third place on 4 wins. Left to Right: Emily, Kong, Neil, big Dave, wee Dave, Alain, Bob and Robert. This entry was posted in St Andrews Table Tennis Club on March 25, 2014 by standrewstt. 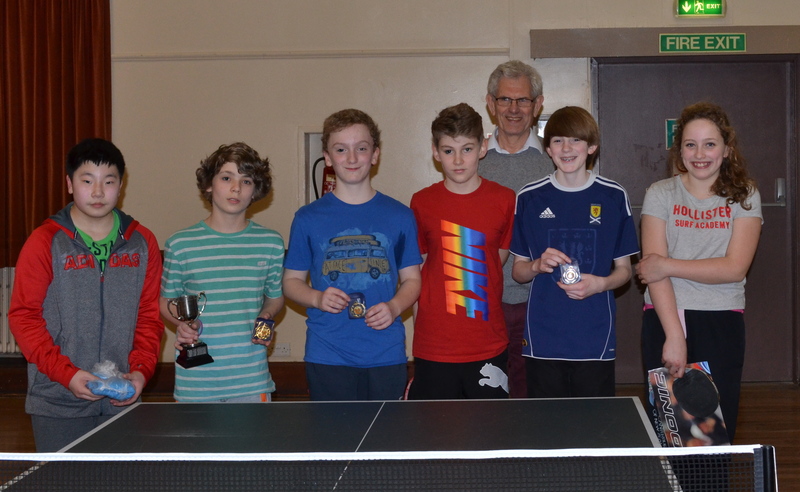 The main event this week was on Monday night when the St Andrews TTC youngsters competed for the Grove trophy in Victory Memorial Hall. Former club stalwart Tim Grove was on hand to present the trophy personally to Jamie Veitch (13) who ultimately triumphed after a very close contest. The competition was played on a round robin basis with each of the players playing 3 sets against each other. After the fourth round of matches Matthew Todd was in the lead, having won 11 sets – but both Jamie and Darren Munn were hot on his heels with 9. In the last round, Jamie picked up 3 sets and Darren overcame Matthew 3-0. With Darren and Jamie both now on 12, the title went to Jamie as he had beaten Darren earlier in the contest. Congratulations Jamie, and well done all! The club’s last two league matches were also played on Monday night. The Prefects (Kong Wan, Ian Smith and Howard Lee) took on Chieftains in Division 2. The match was locked at 3-3 going into the doubles game before Chieftains reeled off three wins, including the doubles, to take an unassailable 6-3 lead. All three Prefects contributed to the points on the night with Howard bagging an early brace after taking five set revenge on his last defeat to Fiona Kinloch. Kong’s point came in game 10 with a fine straight sets win over Stewart Mason. Final score 4-6 in favour of Chieftains. Meanwhile, New Kids fielded regular Nick Shepherd and reserves, Emma Bissett and Dave Beveridge in their final Division 2 match against Thumpers in Broughty Ferry. Nick bagged a hat-trick in straightforward fashion but, unsurprisingly, the reserves had to dig deep against second division opposition. Both Dave and Emma agonisingly lost in five sets to Craig Fraser, but Dave had earlier risen to the occasion with an aggressive straight sets victory over Fraser Smith. With the teams agreeing to play out all the singles matches first, Nick and Dave faced Craig and Ian McLagan needing a win to secure a draw and preserve the Kids unbeaten record for the season. It was a humdinger of a game that went the full distance before the Kids snatched the fifth set 13-11 with the aid of combined net/edge. It has to be said that the resulting celebrations were somewhat unseemly. This entry was posted in St Andrews Table Tennis Club on March 18, 2014 by standrewstt. After the Dundee open championships at the weekend, Monday saw a return to league business for the St Andrews table tennis teams. With the New Kids match called off, Victory Memorial Hall was left to host the much anticipated Division 4 promotion decider between Prospects and Sputniks. Realistically, Dave Beveridge, Neil Lea and Maxi Strobl had to secure at least a draw to keep their team’s promotion hopes alive. Our trio all scored a win against Sputniks’ Germain Julien but none could overturn David Hunter or Jim Fleming. Dave came closest with a narrow five set defeat to David, and along with Neil, suffered another agonising five set loss in the doubles game. The 3-7 defeat extinguishes Prospects’ promotion chances. After the match Dave had no complaints. ‘Although we did well against all the other teams in the league we lost all four of our matches to the top two, and that’s what cost us’. It was also a disappointing end to the season for Swots who lost narrowly to Viscounts on Tuesday night at Ward Road, Dundee. 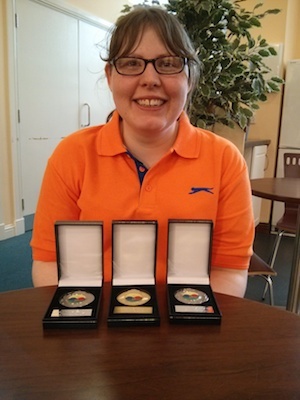 Emma Bisset did best for Swots, winning two games against Eddie Dougan and Graham Hamilton. Captain Collin Bleak and Dave Goddard also beat Eddie but, playing together, they lost the doubles to Eddie and Graham’s son Scott. Scott is another terrific young talent to come out of the Dundee coaching machine and he stole the show by winning all his games. After saving a match point in the fourth set of his match against Graham, Collin agonisingly lost 17-19 in the fifth set. Final score Viscounts 6, Swots 4. The result confirms Swots’ relegation from Division 3. Thursday completed the week, which turned out to be one of the few this season when none of our teams scored a victory. Prefects took on two Rockets, rather than three, at Fort Hill, Broughty Ferry but could still only manage a draw. That was mainly thanks to Howard Lee, who assisted Ken Falconer in securing a fine doubles win, and who made the overall score 5-5 with a terrific five set win in the last game against Carol McLean. Ian Smith had just failed to beat Carol in another five set thriller earlier in the night. •	Prospects – creditable third place in Division 4. This entry was posted in Match reports, St Andrews Table Tennis Club on March 14, 2014 by standrewstt. St Andrews TT club member, Emma Bissett shone brightly at the Dundee and District open championships at Ward Road Gym last Saturday, taking home three medals for her day’s efforts. Emma, along with Ian Johnston, won the mixed doubles trophy. And just to prove her doubles prowess, Emma was also runner up in the ladies doubles (partnering Carol McLean from Broughty Ferry) and the ballot doubles (partnered by Iain Martin). Not one to miss an opportunity, Emma is already seeking bids from anyone who wants to partner her next year. In the same event, Howard Lee did very well to win his initial singles group, only to lose to the aforementioned Division 1 player, Ian Johnston, in the next round. Even with a generous handicap, Dave Beveridge took too long to adjust to first division Paul McCabe’s tricky serves, failed to convert two match points, and lost 60-61 in the semi-final of the handicap competition. This entry was posted in St Andrews Table Tennis Club on March 14, 2014 by standrewstt. The first week in March witnessed the St Andrews Division 2 teams Prefects and New Kids play their fourth match against each other this season and Swots and Prospects get stuck in to settling their relegation and promotion issues in Divisions 3 and 4, respectively. It was a tense week. 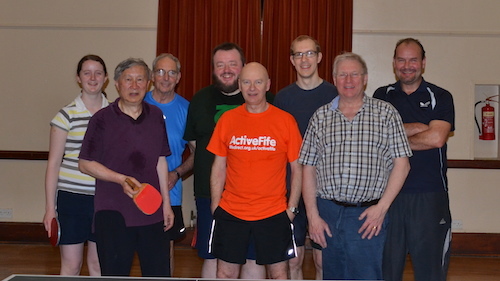 In Victory Memorial Hall on Monday, Prefects fielded Kong Wan, Ken Falconer and Howard Lee against New Kid regulars Peter Bladen and Nick Shepherd who were joined for the first time by Dave Beveridge; given the unenviable task of filling Elaine Forbes’ shoes. The match went pretty much to form with Nick and Peter winning all their games, including the doubles. Peter, however, had to recover from being two sets down against Howard, who also took Nick the full distance. Unsurprisingly, Prefects’ points were all secured against Dave, although Kong had to come back from 7-9 in the fifth set before chalking up his win. Final score 7-3 for New Kids. 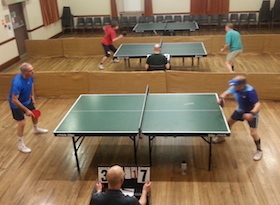 On the adjacent table Swots lined up their usual trio of Collin Bleak, Dave Goddard and Emma Bissett against Tass, who were playing in St Andrews for the third time in recent weeks. Unfortunately, Tass made it three consecutive wins against St Andrews teams with a 7-3 victory that almost extinguishes Swots’ chances of staying in Division 3. Stuart Farqhuarson was untouchable for Tass, winning all three of his singles games, while Collin, Dave and Emma each collected a consolation point for their team. Relegation now looks inevitable for Swots. On Tuesday, Dave Beveridge was back in action. He was joined by Neil Lea and Vuksan Mijovic as Prospects took on Lairds at Ward Road Gym, Dundee in their penultimate league match. It was a tense but thrilling night with Laird’s left hander Jack Bell playing a blinder and taking a well earned hat-trick. However, Dave and Vuksan won both their other singles games and the oldies, Dave and Neil, showed great character and determination in coming back from 0-2 to win the doubles match 3-2. Final score 5-5. The result means that to secure promotion the Prospects must beat Sputniks in their last match next week and hope that Sputniks lose to the league leaders Blackness the week after. This entry was posted in Uncategorized on March 5, 2014 by standrewstt.